India is home to a number of small capacity 2 wheelers. Our country makes numerous motorcycles which have small engines and a lot of performance. The scooters too are continuing down the same path. 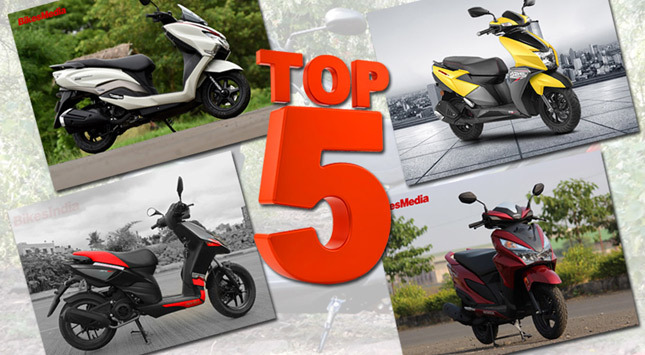 The evolution of the sporty scooters was established by the Honda Aviator and it has come all the way down to TVS Ntorq. Today our market is filled with machines which have the comfort and ease of a scooter and the performance of a sports bike. Let's take a look at such machines. 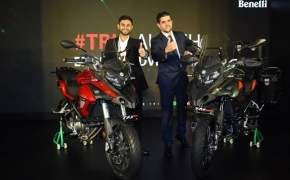 1: TVS Ntorq The latest offering from TVS is a competition killer. 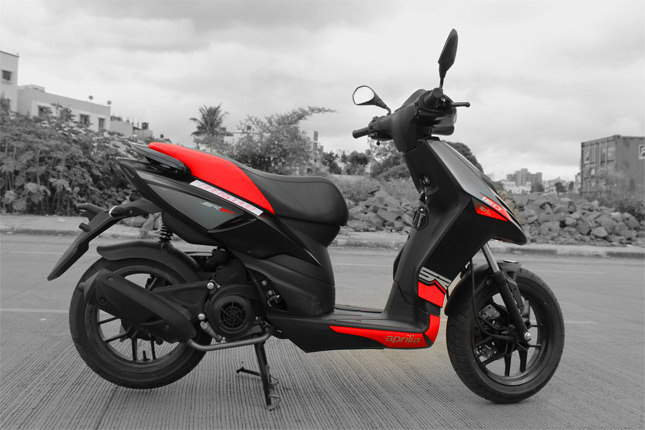 It features integrated LEDs at the front and at the back, the indicators are embedded in the scooter's body. The Ntorq is a full-fledged sports scooter, complete with a new engine and sporty suspensions. 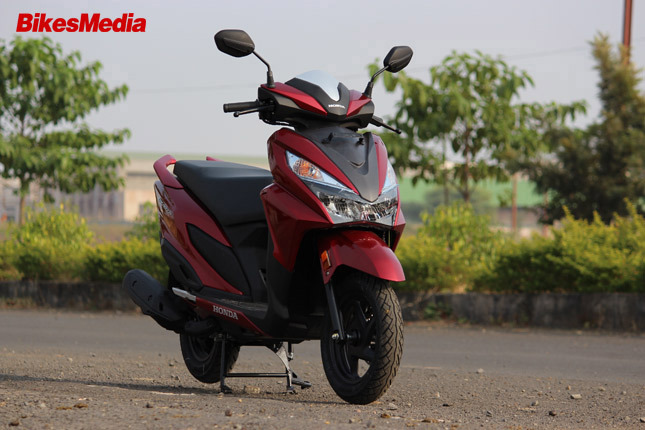 The 125 cc 3-Valve engine produces 9.4 PS of power @7500 RPM and 10.5 NM of torque @ 5500 RPM. It has telescopic suspension at the front and a monoshock spring at the back. The weight of the scooter is a bit heavy at 116 kg but it also increases its highway stability. For effective braking, the disc brake at the front and drum brakes at the rear work very well and hardly lock up. The icing on the cake is the fully customisable digital console which has more features in it than the Duke 390. Ntorq's ex-showroom price is Rs 59,965. 2: Honda Grazia A close competitor to the previous scooter is the Honda Grazia. It boasts of having a great design, build-quality along with a refined engine. The headlamp consists of 6 led units, parking lights included. The rear too has LED lights for clear visibility. The 125 cc 2 valve engine produces 8.63 PS of power @ 6500 RPM and 10.54 NM of torque @ 5000 RPM. The low-end torque on the scooter is really good and cutting through traffic is a breeze. The weight of the scooter is low at 107 kg and the seat height is a bit high at 766 mm. The scooter also features telescopic forks and spring loaded hydraulic for smooth riding. It also gets CBS for additional safety but it is only available on drum brakes variant. The Honda Grazia is available in 3 variants STD(58,810) , Alloy(Rs 60,741) and, DLX(Rs 63,18). 3: Aprilia SR 125 The newly launched SR 125 from Italian manufacturer has made the performance scooter market even more affordable for the people. It is just as futuristic looking as the TVS scooter. It features a 125 cc 2-valve engine which makes an impressive 9.4 BHP of power but only 8.2 Nm of torque. The scooter is designed for revving higher, that's why its power hits at 8500 RPM. Despite having a sporty look, the scooter offers great comfort. The front suspension comprises of twin telescopic forks and the rear consists of a preload adjustable mono-shock spring. The front brake consists of a disc brake with a dual piston caliper while the rear has a 140 mm drum brake. 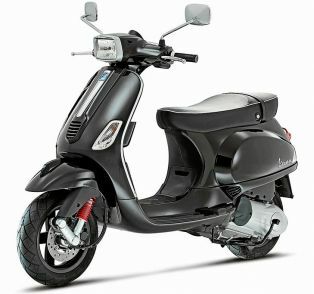 The weight of the scooter is on the heavier side at 122 kg and its seat height is higher as well, at 775 mm. For anyone who wishes to ride on the highway via a scooter, then Aprilia SR 125 is a great scooter. It retails at Rs 65,309 ex-showroom. 4: Suzuki Burgman Street 125 When it comes to comfortable highway touring on a scooter the Suzuki Burgman from Suzuki can do it without breaking a stress. 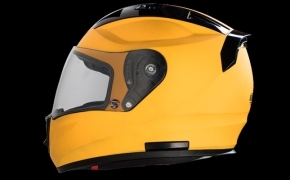 The easy riding position and the added fairing does a great job of keeping you safe from bumps and wind blasts. 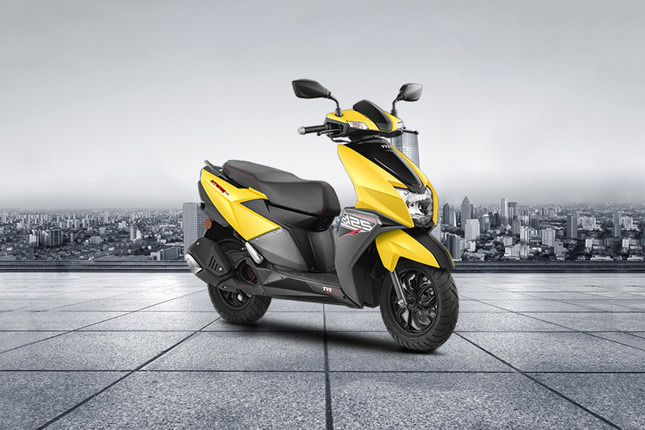 The scooter features a 125 cc engine which produces 8.52 BHP @ 7000 RPM and 10.2 NM of torque @5000 RPM. 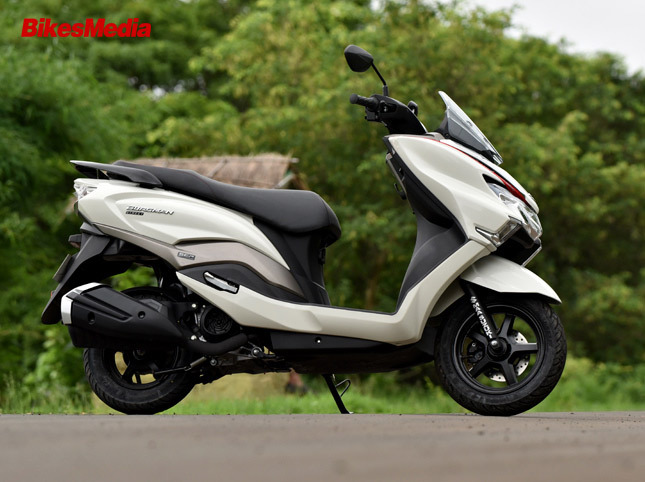 At the front, the Burgman Street 125 features a disc brake along with telescopic forks suspension. At the rear, a hydraulic type suspension along with drum brakes keep the scooter comfortable and safe to ride. Despite having a big fairing the weight of the scooter is just 108 kg which is easily manageable. The seat height, however, is at 780 mm, which instantly puts this scooter out of reach of people who are short in height. Burgman features LED headlights and taillights along with a fully digital console, which is a reminiscence of Gixxer 150. 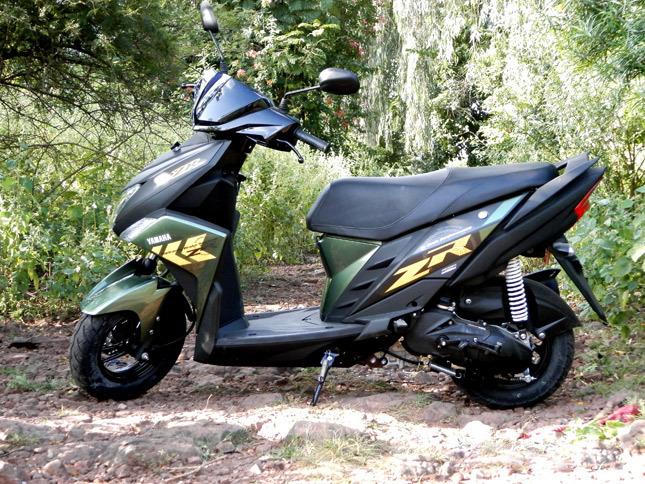 In short, It is a great scooter for highway touring and long rides. It retails at a price of Rs 68,000. 5: Yamaha Ray ZR Being the smallest scooter in the segment, the Yamaha Ray ZR is a good scooter nonetheless. It features a smaller 113 cc 2-valve engine which makes around 7 BHP of power @ 7500 RPM and 8.1 Nm of torque @ 5000 RPM. It is a very light scooter at just 103 kg and is very easy to manage in traffic and a breeze to ride in the city. Ray ZR features a disc brake along with the telescopic fork and a unit swing along with a drum, at the front and rear respectively. In terms of electrical, it features a Halogen bulb and a purely analogue console. It is a small and light scooter which is suitable for anyone who is a learner. It retails at Rs 55,898.